At first I thought the card would have simplified and traditional Chinese, but apparently it's simplified Chinese and (simplified) Japanese instead. You can see the difference particularly well in "2", where the bottom character is quite a bit more simplified (this is one that Japan simplified but China didn't); you might also be able to see the difference in "," (Japanese dropped a line in their simplification). For cases where both simplified, but differently, consider "N" and "x"; for a case where both simplified identically, "p". The exceptions (where traditional characters rather than simplified Japanese ones are used) are "8" and "? 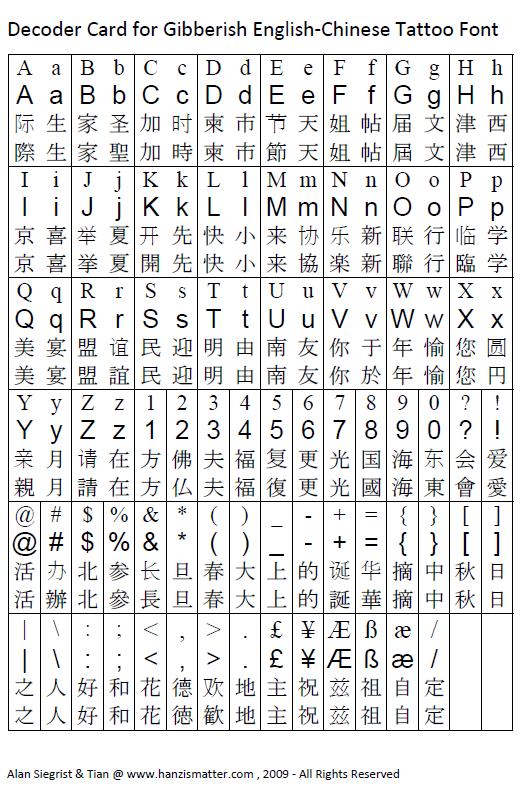 ", where Japanese uses the same shape as simplified Chinese. You are very observant. I made up this handy-dandy decoder card just for my own benefit. I know Japanese but very little Chinese and still have a hard time reading simplified Chinese. The font and the tattoos are in simplified Chinese, so I added the equivalent Japanese characters as an aid to help me read and search. In some places where the simplified Chinese and Japanese are identical, I added the traditional Chinese forms instead of the Japanese forms. Perhaps I should have been a little more consistent by adding the traditional form for "p" for example. Another thing that could be improved is that the English letters are just repeated on the second line, instead of appearing in the actual Chinese font used for the tattoos, which is how it should be. Maybe I'll do up a better decoder card and send it to Tian later. Wow! They even made punctuation marks and special characters. I'm looking forward to the other character sets like *ahem* Turkish, French, German (though ß is already there), Scandinavian, Icelandic, Slavic Latin, Spanish, Portuguese etc. What's it, we don't deserve any gibberish? Perhaps I should have been a little more consistent by adding the traditional form for "p" for example. "p" = Simplified Chinese & Japanese = 学, "xue2" in Chinese and "gaku" in Japanese [via various Chinese dialects] = 學 in Traditional Chinese. I'm surprised they didn't use the more ancient character for ( = 旾 as a simplified version of 春! Traditional Chinese in Kaishu for "9" = 海,with two dots in the middle of 母, not the Caoshu form used by Japanese: with one vertical stroke. Thanks; this could be a fun game in my tattoo-heavy city. That said, has anybody studied the causes of this phenomenon academically? I'm honestly curious why so many people deliberately get "cryptic" tattoos on parts of their bodies that are in constant public view. In fact, a classmate of mine had "acer palmatum" tattooed on her biceps. When I asked her what was the significance of Japanese Maples to her (I'm a gardening enthusiast and recognized the binomial), she got inexplicably offended that I would even ask and seemed shocked that I knew what her tattoo referred to. And of course, she didn't answer the question. I guess as an un-tattooed person, I will never understand the mindset. Have you figured out any pattern to this gibberish? Good question. I was curious about this too. My Chinese is not too strong so I am not too sure, but although the order of characters seems to be random, I seem to have found a few Chinese phrases strewn about in this jumble. But the character 共 is oddly absent. So I guess someone made up this font for some purpose possibly related to holding some sort of event. My pet theory is that someone needed to print banners in Chinese but did not have a Chinese computer system. 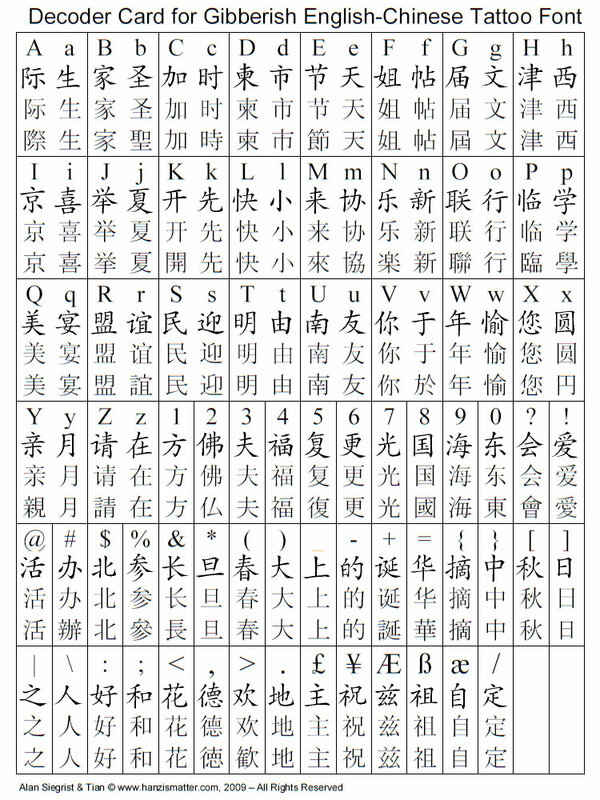 With this font, printing Chinese banners is possible within the very limited character set. 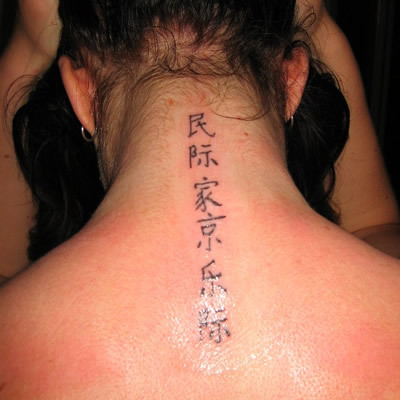 But then someone made the font publicly available and now people are using it to get gibberish Chinese tattoos. Oh my God -- Alan, I think you are right. Merry Christmas, and Happy New Year, indeed! Someone found a one-page glossary of common phrases and country names! !